Using your grill every season can cause it to wear out and make you realize it might be the time for you to buy a new grill with your hard-earned cash. However, before buying a new grill, it is always best to do some research. 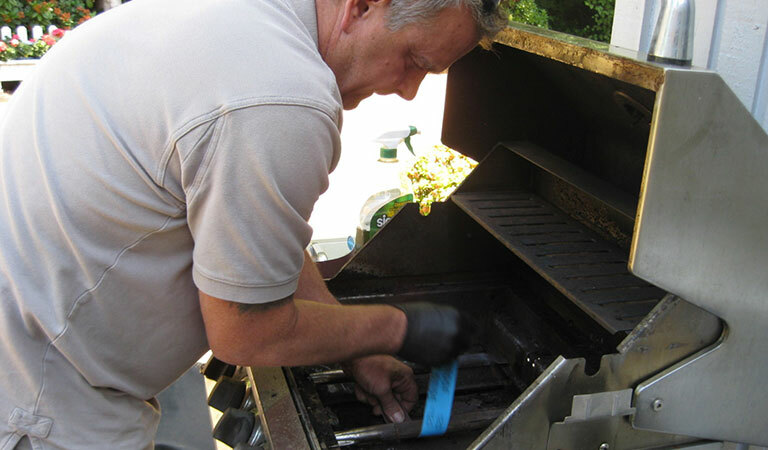 Some parts of a gas grill must be periodically replaced while others only need repairing. Charcoal grills do not have as complicated designs as gas grills and can last a long time without the need of replacing grill parts. However, if you feel that your gas or charcoal grill has become too old, or not catering to your needs, you might consider buying a new grill. Here at Grills Forever we have provided a guideline on what to do if your grill is causing trouble for you. Grills usually last for a very long time. Most grills can last more than 5 years, well above their warranty periods. However, even after regular maintenance and covering it whenever needed, often there are issues that will make you realize you have to replace some of the grill parts. If your grill has crossed that warranty line, replacing grill parts is the option. Depending on your budget, you might need to compare the cost of replacing the parts against buying a new grill. To help you make a sound judgment on which grill parts you should be replacing, you should consider these factors. Too much rust or cracks in the firebox or heat source indicate that you have to bid farewell to your grill and get a new one. Grill burners can come with a warranty of up to 10 years so these last a long time. However, if there are any signs of uneven or yellow flames or unusual flaring, you should consider repairing while still under warranty. If burners and igniters have too much grease on and appear corroded, then you should replace them with new ones. 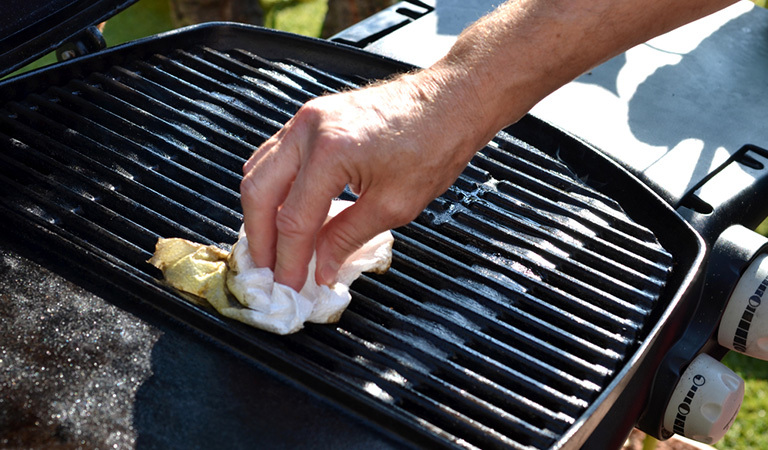 If your grill grates are flaking and cracked in some areas, consider replacing them with new ones. Heat barriers should also be replaced every once in a while. Check if the gas hose and regulator are cracked or not. Spray a mixture of dishwashing liquid and water onto the hose and see if the area bubbles or not. If it bubbles, it indicates a gas leak you should definitely replace the gas hose for safety. The Overfill Prevention Device (OPD) of a gas tank can be damaged and needs repairing. Regulator controls the flow of gas into the grill. If there is a leak or damage in this regulator, it will have to be repaired. There are control valves that control the flow of gas to each of the burners of the valve. These can be disassembled easily. If there are any bugs or clogs inside the valves, clean it out with a thin wire and assemble the part the way it was before. Venturi tubes are present in between the valves and the burners and should be cleaned and repaired if bugs get inside. Replacing Grill Parts: What to Consider if You Need to Replace Your Grill? So your grill has lasted a long run and you feel that it is just not good enough for you anymore. If that is the case, you should go through these checkpoints and ensure what type of grill will best cater to your needs. Budget: Obviously, your budget should always come first when you are deciding to buy a new grill. Fuel: Actually, this depends on your preference. Would you want to do your BBQ party with a charcoal grill, gas grill, wooden or electric grill? The choice is yours. However, if you are intending to buy a gas grill, then you should consider whether to use natural gas (methane) or propane (LPG). Both gases have little difference in performance. Natural gas is provided directly through a line from a local utility provider. LPG can be purchased in portable refillable tanks. Location: Do you want a built-in grill or a portable one? Portable grills can be moved around, taken to picnics or outdoor camp spots and are useful if you are moving to a new home. However, if you like to hold indoor BBQ parties and your kitchen has enough space then a built-in grill is a better option for you. This would also give your kitchen a stylish decoration and your home, more value. Grill Options: Direct heat grills usually have food on top of the fire directly with a tamer plate in between the burner and the grill grate. Indirect heat grills use a briquette system that would deflect direct heat but still able to grill food. You can also buy multiple types of grills for multiple recipes. So along with a grill for ribs and steaks, you can also opt for other grills that have infrared burners or side burners specifically designed for other kinds of recipes. Grills should have efficient ash and grease collecting systems so that the heat source is not interrupted by clogs or juices from food. Brand and Warranty: Brand reputation matters. A reputed brand would have grills with better construction design, craftsmanship and durable grills that could go on for a prolonged period of time with little maintenance or chances of repairing or replacing, coupled with the reduced risk of a fire hazard. When buying a grill simply shake the unit for a bit. If it feels flimsy or weak, then you should definitely opt for sturdy steel construction design. Check BTU and Steel Grade: BTU (British Thermal Unit) is used to quantify how much heat energy a grill can produce in an hour. The higher the BTU number the quicker you get to serve food. Also, check the grade of steel used. The lower the number, the better the quality of the stainless steel. Easy of Assembly: Some grills take hours to assemble and disassemble which could be a nuisance, especially if you want to clean your grill regularly. Go for grills that can be assembled and disassembled much quicker and still work. Extra Features: If you want your backyard cooking experience to go up a notch, consider other sophisticated components that can come along with your grill. You can choose porcelain grill grates instead of stainless steel or cast iron grates as these do not rust easily and last long. Some grills come with LED lights so that you can cook at night time. This is perfect for backyard night BBQ parties. If you like to cook for a large number of people then you should consider buying a larger grill with more burners, such as infrared burners. You might want to buy a gas grill that comes with shelves, cabinets and drawers to be able to keep spices and accessories required while grilling. Other add-ons include an integrated refrigeration unit, deep frying features, heat barriers, rotisseries, etc. Most grills last for a minimum of 3 years without requiring any maintenance. With proper cleaning and regular inspection, your grill can last as many as 7 years or even more. All types of grills should be cleaned regularly to ensure better performance and should be covered to prevent dust and bugs to clog the systems. 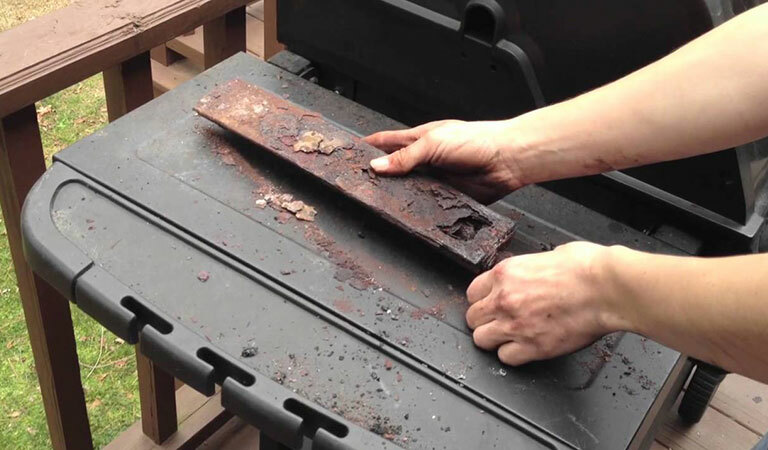 However even after such careful procedures, often grill parts become too damaged to use, so they need to be repaired. Nowadays, grills are less complicated in terms of design and thus users can repair themselves. Specific parts of a grill should be replaced instead of repairing. 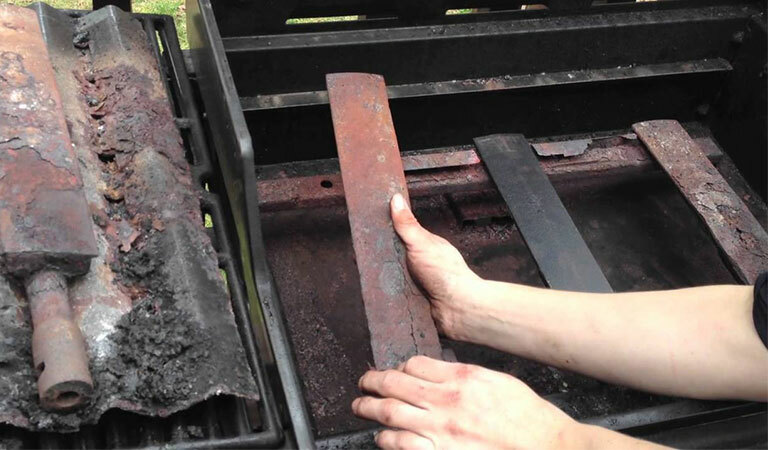 Replacing grill parts could be a bit costly. However, if you think that your grill has lived a long life and is way too old to fix, then you should consider welcoming a new grill to your yard. Pretty impressive article. 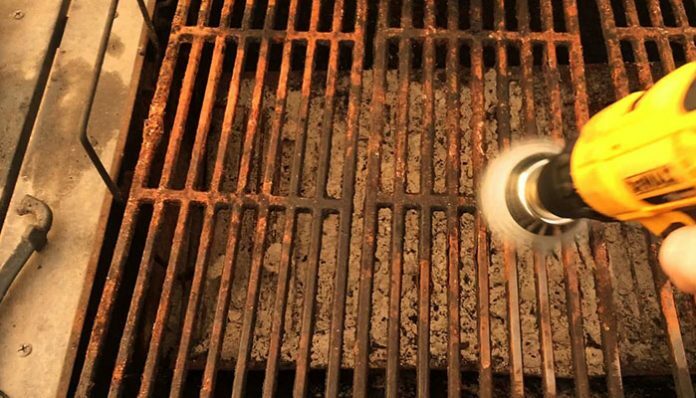 But i was wondering from where can i get the power tool for cleaning grill (The one in the photo above) ? Hey, thanks for reaching us out! You can purchase grill cleaning power tools from amazon! Here, I am including a link of the renowned brand DeWalt, hope this helps you! I was about to buy a new grill, turns out it was only a valve problem. Just replaced it and everything works fine now! This article helps a lot to get the things done! Thanks a ton! Great article on repairing grills, step by step instructions really made everything easy for me! Thumbs up!